Why does your store need Better Coupon? What is Better Coupon Generator? How to Configure Mageplaza Coupon Generator? To simplify the work for online stores in building and sending voucher codes to customers, Mageplaza Coupon Generator for Magento 2 is released with some outstanding features. Along with a more convenient system of coupon generators, the module also provides a quick coupon link builder tool and an auto-apply coupon link generator. Learn more: How to Apply Multiple Coupons in Magento 2. E-vouchers play an important role lifting sales and building customer engagement in online business. According to digitailsocialretail, 91% of customers who used a coupon code when shopping at an online store will be likely to visit the brand again in the future. In addition, digital vouchers also help increase the shopping cart sizes from an average of $122 to about $216. Hence, equipping a system for e-coupons generation on your Magento 2 store is a really necessary. The coupon builder system in Magento 2 is not flawless, you already know that. In the backend, it may take up to 5 minutes for a single code to be configured and generated. When the number of requests for coupons in an online store is too high, admins can be overwhelmed by the heavy and time-consuming workload. Besides, having this job done that manually seems to be pretty outdated and unprofessional. To solve this issue in creating and sending coupon codes to individual customers, Mageplaza Better Coupon becomes a smart coupon generator tool which store admins can use to create coupon codes in few seconds. Magento 2 Coupon Generator is a tool which helps admins create one or many coupon codes based on existing rules configured in the backend. In case, a code can be immediately sent to an email address right after it is generated depending on the configuration. Moreover, the extension integrates API in creating coupon codes so it simplifies the generation process. John has an online store. One day, a customer comes across his website and asks for a discount as it is the customer’s birthday. John knows that he needs to generate a code based on a rule from the backend. However, creating coupon codes manually on default Magento 2, takes lots of time and, unfortunately, lacks of precision. Besides, customer experience may be low because of this unprofessionality. To solve this problem, he uses Mageplaza Better Coupon which is able to automatically generate a coupon code based on an existing Cart Price Rule and sends it to the customer. This work takes him only few seconds in the backend. 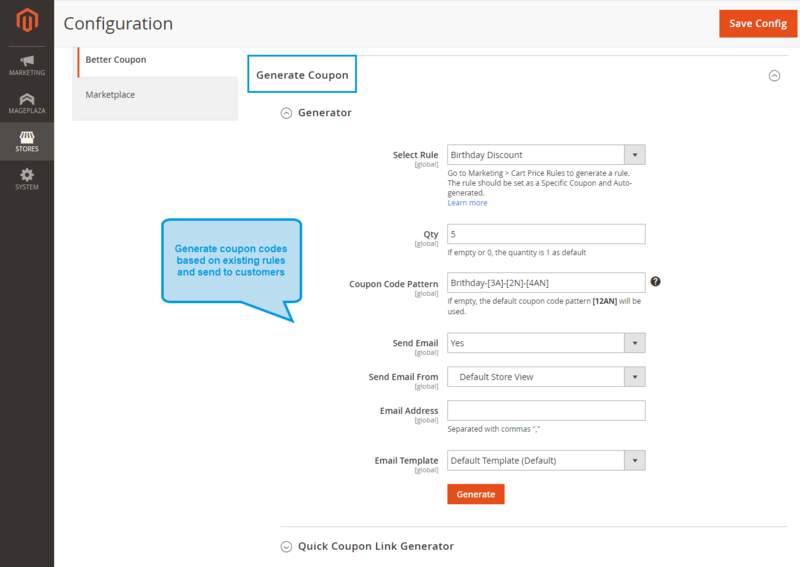 To configure the Generator, you can go to Stores > Configuration > Mageplaza > Better Coupon. To the right, the configuration grid is presented. You can easily find the section to Generate Coupon there, but before you can start, please don’t forget to turn the module on. The next step is really easy like a piece of cake. We would like to explain some essential fields down below so you can configure the module they way you want. Select rule: This rule is for the generator to base on. Remember that the selected rule should be configured in Marketing > Cart - - Price Rules first. As a coupon code will be randomly generated, the rule which it’s based on should be configured as Specific Coupon and Auto-generated. You can refer here to learn how to create coupon codes on Magento 2. Coupon Code Pattern: Just a quick reminder that the default pattern is [12AN]. In case you find it unnecessary, just leave the box blank and the default will be applied. About sending emails: Only if you want to send the code to someone, you have to fill these fields. Otherwise, you’re free to go with the orange button Generate.